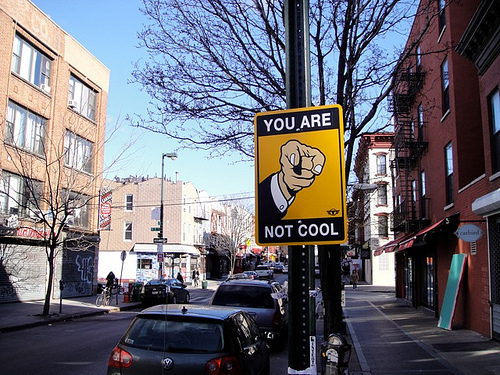 A mysterious street artist named TrustoCorp has placed street signs around Brooklyn, with messages ranging from silly to sophomoric. TrustoCorp also took his or her show on the road recently, posting signs around Los Angeles and Miami. A gallery of the signs can be viewed on TrustoCorp’s flickr page. I’d like to have signs like that to post on all the cars that are double parked around Jersey City (mostly New Yorkers and Pennsylvanians). I think this sign should be post in other countries too 🙂 I can make some recommendations 🙂 However an interesting idea!